NVIDIA Philippines is hosting the 1st NFAN event in Philippines to celebrate this uplifting momentum in gaming. 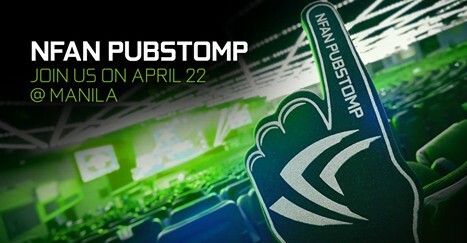 NVIDIA invites the fans to join this “NFAN Pubstomp” to meet new friends, play games and check out the latest in NVIDIA GeForce technology. NVIDIA will have games, food, and a huge range of prizes. Registration is on a first come, first served basis and SPACE IS LIMITED to 100 attendees. To register please complete the form and upload a screen shot of your GeForce Experience My Rig. You can vote your favorite gaming notebook for a chance to win it at the event!